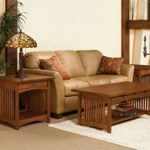 These beautiful tables will add the warmth and charm of mission style furniture to your home. The coffee table features two drawers for storage in addition to a full size bottom shelf. The end tables have a single drawer as well as the bottom shelf.